Topographic model of the Snowy Mountains Scheme sold by Snowy Mountains Authority between 1960 and 1965. This model is made from a thin moulded piece of plastic contoured to form mountains and valleys. The map area of the model is bordered by Tumut and Canberra to the north, Cooma to the east, Dalgety and Thredbo towards the south, and Tooma and Tumbarumba to the west. 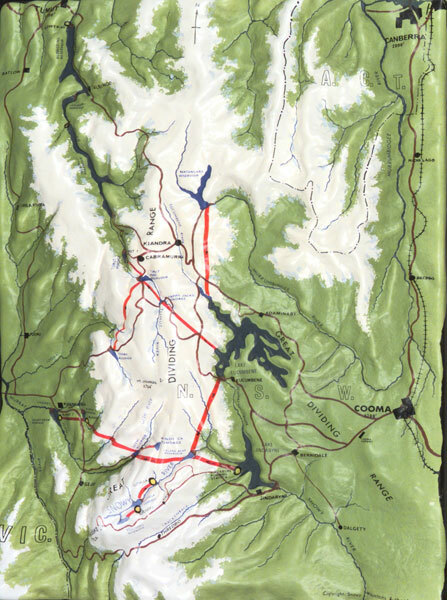 The Snowy Mountains Scheme’s tunnels are marked in red, with black arrows to indicate the direction of water flow. The power stations and pumping stations are located with black circles filled with yellow. Mountain peaks are coloured white, with altitude measured in feet, valleys are coloured green, rivers and reservoirs are blue, roads are brown, and the railway line and towns are black. Dimensions: 75mm high x 360mm wide x 465mm long. The model shows an overview of the engineering features of the Snowy Mountains Hydro-Electric Scheme. The model was made to promote the Scheme and to interpret the construction of the scheme to visitors to the Scheme’s discovery centres during its construction and they sold in their thousands. The Snowy Mountains Hydro-Electric Scheme is the most complex, multi-purpose, multi-reservoir hydro scheme in the world and the Snowy Mountains Authority ran a major public relations programs to garner public and political support and so ensure the Scheme would be as originally planned. The model shows the layout of the two sections of the Scheme that diverts water from the Snowy River into the Murrumbidgee River via the Blowering Reservoir; and the other section that diverts water into the Murray River for irrigation. The model shows Lake Eucumbene as the link between the two sections. The Great Dividing Range depicted by the model ensures that the Snowy Mountains region receives the most consistently reliable snow and melt water in Australia. However the topography as shown by the model created the challenges to the engineers and workers who constructed the Scheme. Every tunnel, dam and power station became a symbol of national achievement. It is significant that model also shows the Kosciusko power station and reservoir that were never built due to growing costs and concerns from the growing environmental movement of the 1960s. The scheme however never lost political support. The Snowy Hydro model has historic significance as evidence of the Snowy Mountains Authority’s major public relations programs to garner public and political support for the Scheme and so ensure that the Snowy Hydro Electric Scheme would be fully completed as planned. The Snowing Hydro model is also evidence of its iconic status in the perception of the Australian public as a symbol of Australian industry and achievement. A nationalistic sentiment that still exists in the public mind to this day. Coupe, S & Andrews, M 1992, Was it only Yesterday? Australia in the Twentieth Century World, Longman Cheshire, Sydney. Heritage Office & Dept of Urban Affairs & Planning 1996, Regional Histories of NSW, Sydney. Heritage Collections Council 2001, Significance: A guide to assessing the significance of cultural heritage objects and collections, Canberra.